Continental Gold Inc. (TSX:CNL) (OTCQX:CGOOF) is pleased to announce additional high-grade assay results from seven definition holes and 11 expansion and infill holes drilled into the Yaraguá system as part of its 2018 definition and exploration drilling program at its 100%-owned Buriticá project in Antioquia, Colombia. The Company presently has 11 diamond drill rigs in operation; four rigs are being utilized for the ongoing stope definition drilling program and the other seven rigs are conducting infill and mineral resource expansion drilling at the Yaraguá and Veta Sur deposits. located along the main access ramp in the central portion of the Yaraguá system located slightly east of BMZ1. Results to date are being used to verify and finalize stope designs and schedule production from this area, anticipated in 2020. Definition drilling into BMZ1 is anticipated to continue throughout 2019 as development advances vertically and new chambers are constructed. These results, coupled with earlier results announced on April 16, 2018 (i.e. BUUY370D01: 4.25 metres @ 83.65 g/t gold and 29.3 g/t silver) confirm the pervasive nature of this high-grade shoot and warrants infill and definition drilling in 2019 to outline stope designs for future mining. Continental’s 100%-owned, 75,023-hectare project, Buriticá, contains several known areas of high-grade gold and silver mineralization, of base metal carbonate-style (“Stage I”) variably overprinted by texturally and chemically distinctive high-grade (“Stage II”) mineralization. The two most extensively explored of these areas (the Yaraguá and Veta Sur systems) are central to this land package. The Yaraguá system has been drill-outlined along 1,350 metres of strike and 1,800 vertical metres and partially sampled in underground developments. The Veta Sur system has been drill-outlined along 1,000+ metres of strike and 1,800 vertical metres and has been partially sampled in underground developments. Both systems are characterized by multiple, steeply-dipping veins and broader, more disseminated mineralization and both remain open at depth and along strike, at high grades. The broad mineralized zone consists of a group of modelled precious metal-bearing veins in the current mineral resource estimate block model with mineralization occurring between these veins, generally in the form of veinlets at oblique angles to strike. The majority of the mineralization between modelled veins is not in the current mineral resource estimate, providing potential upside both in terms of identifying significantly broader and more productive zones for mining and increased mineral resources. To date, the Company has identified up to seven BMZ targets for testing and will systematically drill each target zone as underground mine development advances. BMZ1 encompasses a matrix of the east-west trending FW, San Antonio and HW veins as well as a package of a NW‑SE vein and subsidiary veinlets. Mauricio Castañeda, Vice-President, Exploration of the Company and a Qualified Person for the purpose of NI 43‑101, has prepared or supervised the preparation of, or approved, as applicable, the technical information contained in this press release. Reported intervals include minimum weighted averages of 3 g/t gold equivalent (75:1 Au/Ag) over core lengths of at least 1.0 metres. Assays are uncut except where indicated. Besides rigorous chain-of-custody procedures, the Company utilized a comprehensive quality control/quality assurance program for the channel samples. All quality control anomalies were addressed and/or corrected as necessary to assure reliable assay results; no material quality control issues were encountered in the course of the program. Crush rejects and pulps are kept and stored in a secured storage facility for future assay verification. Although historic correlation between analytical results from the Company’s internal laboratory and certified independent laboratories for gold and silver analysis have been within acceptable limits, the Company’s internal laboratory is neither independent nor certified under NI 43-101 guidelines and, as such, channel sampling results in this release should only be taken by the reader as indicative of future potential. For exploration and infill core drilling, the Company applied its standard protocols for sampling and assay. HQ and NQ core is sawn or split with one-half shipped to a sample preparation lab in Medellín run by ALS Colombia Limited in Colombia, whereas BQ core samples are full core. Samples are then shipped for analysis to an ALS-certified assay laboratory in Lima, Peru. The remainder of the core is stored in a secured storage facility for future assay verification. Blanks, duplicates and certified reference standards are inserted into the sample stream to monitor laboratory performance and a portion of the samples are periodically check assayed at SGS Colombia S.A., a certified assay laboratory in Medellín, Colombia. For stope definition core drilling, the Company applied its standard protocols for sampling and assay. The HQ3 samples were full core and provided sample widths between 0.2 to 1.0 metres weighing approximately 2 to 8 kilograms. Custody of the Samples were transferred at the mine site to Actlabs Colombia using rigorous chain-of-custody procedures. Full-core HQ3 samples are prepped and analyzed at Actlabs Colombia’s ISO 9001 accredited assay in Medellín, Colombia. The remainder of crushed rejects and pulps are stored in a secured storage facility for future assay verification. Blanks, pulps duplicates, coarse duplicates and purchased certified reference standards are inserted into the sample stream to monitor laboratory performance. A portion of the samples are periodically check-assayed at ALS Peru’s ISO 9001 accredited assay laboratory in Lima, Peru. The Company does not receive assay results for drill holes in sequential order; however, all significant assay results are publicly reported. For information on the Buriticá project, please refer to the technical report, prepared in accordance with NI 43‑101, entitled “Buriticá Project NI 43–101 Technical Report Feasibility Study, Antioquia, Colombia” and dated March 29, 2016 with an effective date of February 24, 2016, led by independent consultants JDS Energy & Mining Inc. 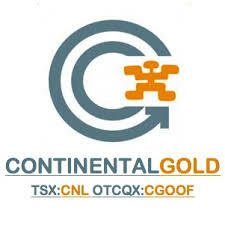 The technical report is available on SEDAR at www.sedar.com, on the OTCQX at www.otcmarkets.com and on the Company website at www.continentalgold.com. Continental Gold is the leading large-scale gold mining company in Colombia and is presently developing it’s 100% owned Buriticá project in Antioquia. Buriticá is one of the largest and highest-grade gold projects in the world and is being advanced utilizing best practices for mine construction, environmental care and community inclusion. Led by an international management team with a successful record of discovering, financing and developing large high-grade gold deposits in Latin America, the Buriticá project is on schedule with first gold pour anticipated during the first half of 2020.